Urban rivers carve allegiances. The Gipping becomes tidal as it enters the Borough of Ipswich, splits around an island, and remerges as the Orwell. 1500 years ago, along this fertile estuary, Anglo-Saxon trading and manufacturing settlements merged to form England's longest continually-occupied town, Gippeswyk, the modern Ipswich. 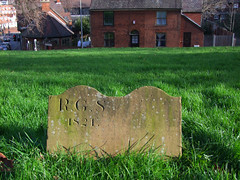 For a while, it was the largest manufacturing and trading town in northern Europe, and even towards the end of the twentieth century Ipswich was first and foremost an industrial port. The Orwell meets the Stour eight miles downriver, and disgorges into the great German Ocean at the border between the Anglo-Saxon kingdoms of East Anglia and Essex. Not far north of Ipswich was the East Anglian capital at Rendlesham and the great royal burial ground at Sutton Hoo overlooking the Deben. 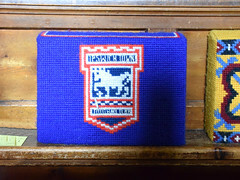 By the time Ipswich had emerged as a proper Borough at the end of the 12th century, its heart was in the quayside parishes of St Peter, St Clement and St Mary at Quay on the north side of the river. Across the river, the gentle hills were quietly settled by farmers and villagers. Stoke Hills overlooked the town centre across the water, but the main road to London was some way to the west, crossing the river at Handford, and so Stoke developed a strong and perhaps slightly smug independence, an identity all of its own. 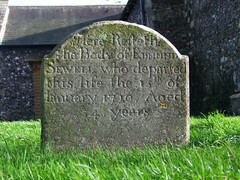 Even today, older Ipswichers can be heard to refer to the part of the town south of the river as 'Over Stoke'. 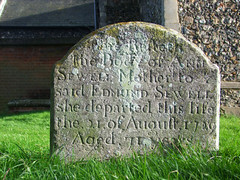 Stoke was large enough to form two parishes, St Augustine and St Mary. 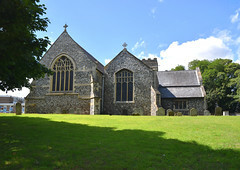 The parish church of St Mary occupies a site on a dramatic bluff overlooking the river, across which it faces St Peter, a couple of hundred metres away. 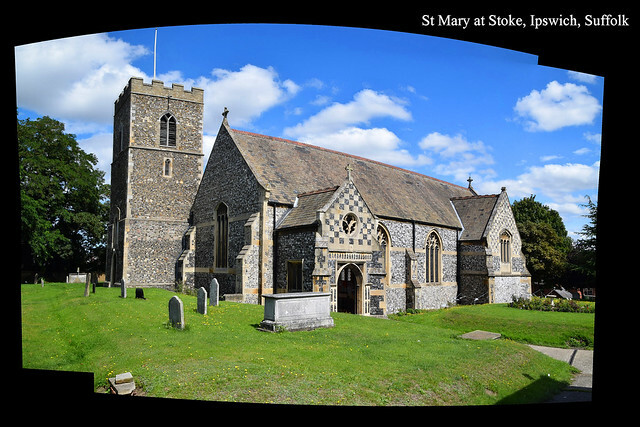 St Mary at Stoke is the only one of the twelve surviving medieval churches in Ipswich town centre to stand south of the River Orwell. 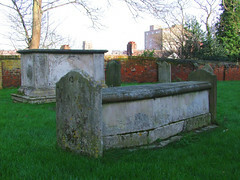 The church of St Augustine, which served the quayside area south of the river, is now lost to us. 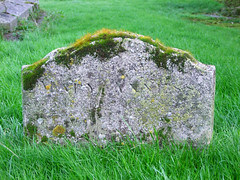 It was still in use in the 1480s, but all traces of it have completely disappeared. It was probably about 100 yards away in Vernon Street. 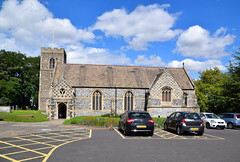 After the Reformation, St Augustine's parish was merged into that of St Peter, and St Mary at Stoke retained its relatively rural feel, so close to the heart of the town. 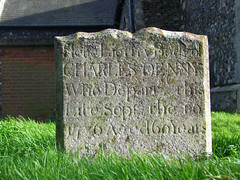 As recently as 1801, the population of the parish was just 385. And then, the railways came. The impact of their coming upon a town like Ipswich, which was already a burgeoning industrial port, should not be underestimated. However, the Stoke Hills, as gentle as they are by Northern standards, proved an impenetrable barrier to the line from Liverpool Street. Consequently. Ipswich's first railway station was built in the south of the parish of St Mary at Stoke, and a mid-Victorian railway town grew up around it. In the 1860s, a tunnel was blasted through the hills so that the line could be extended to Norwich, and a new railway station was built, again in St Mary at Stoke parish, linked to the centre of Ipswich by a major new road, Princes Street. 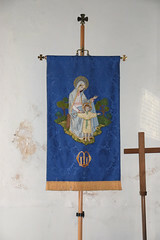 By 1871, the population of the parish had grown to more than 3,000, a ten-fold increase in less than a lifetime, unmatched by almost any other parish in East Anglia. 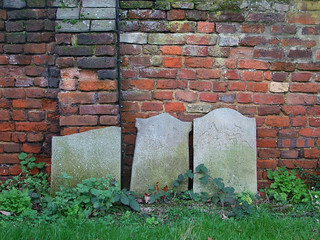 This development needs to be borne in mind when exploring St Mary at Stoke parish church. 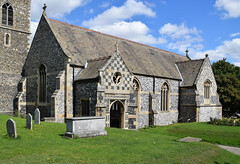 From the south, you see a large, blockish Victorian building with flushwork on the porch and transept, a little characterless otherwise. 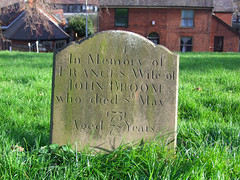 The focus is all to the south, the graveyard dropping away quickly on the other three sides, as if reminding us of the long tradition here of independence from Ipswich over the water. However, walking around to east or west you discover that behind it there is another church, medieval this time, and still rural in feel. 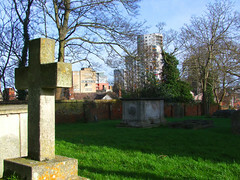 The tower is at the west end of the older church, and the two are joined as if non-identical yet conjoined twins. 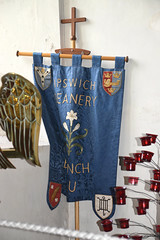 This is a welcoming church, as are most in Ipswich town centre, open to pilgrims and strangers every day. You step inside to the impression of two churches joined together, the near one Victorian and wide, the far one narrower and older. In fact, this impression is almost exactly right. The original medieval church is now the north aisle ahead of you, which is why the tower is off-centre. The 1872 nave you step into is the work of the great Anglo-catholic architect William Butterfield. 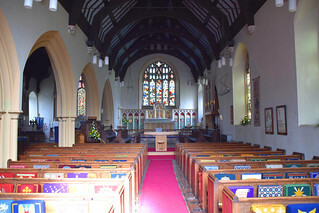 This church came 15 years after his masterpiece All Saints, Margaret Street. 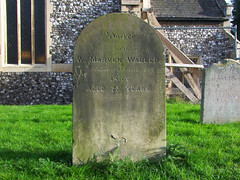 And yet, St Mary at Stoke has nothing like the excitement of that or his other fine London churches. 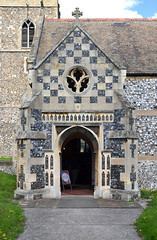 The chequerboard flintwork on the porch and transept are perhaps echoes of St Mary le Tower in the middle of town. There were two major rebuildings here. The first, in 1864, rather unforgivably destroyed a magnificent Tudor porch in red brick. This rebuilding, by Richard Phipson, the Diocesan architect, gave us the huge, austere transept on the northern side. The intention seems to have been to increase the capacity of the building while tarting it up a bit. Twelve years later, Butterfield's work here was rather more ambitious. He created a large urban church to the south of the original, the joining arcade making an aisle of the old nave. Standing inside the main entrance, everything appears 19th century, from the font nearby to the grand reredos with the east window above. But this illusion of an entirely Victorian building is dispelled if you walk through the arcade and look up. 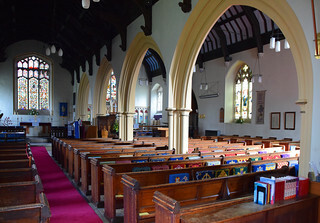 Here, the north aisle, which was the original church, retains its medieval hammerbeam roof. 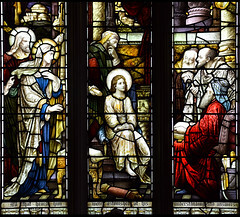 Because of this, the aisle retains a different atmosphere to the nave, its patterned glass in the aisle east window a counterpoint to Clayton & Bell's typically plodding east window to the south of it. The Heaton, Butler & Bayne glass along the south wall is better. 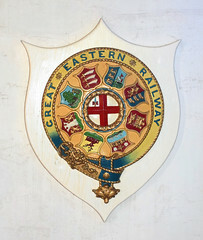 Halfway along the rather stark north wall is a Great Eastern Railway insignia from a train, a reminder of the industry which almost single-handedly turned this parish into an urban one. 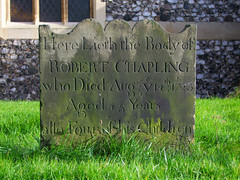 In the 20th century, this church had two chapels of ease in its parish. 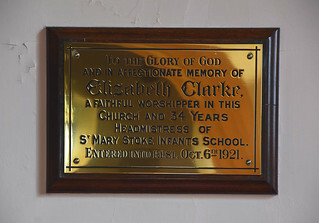 St Etheldreda was near the railway bridge on Wherstead Road, and St Edmund was beside the school on Ranelagh Road. 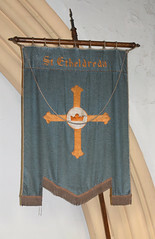 These two churches have now completely disappeared, but a haunting remnant survives in the form of St Etheldreda's banner on display in the north aisle. 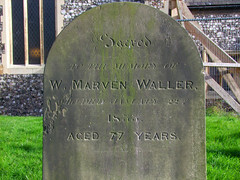 The population of the parish fell sharply in the years after the Second World War because of slum clearance along Vernon Street and Wherstead Road. There was further large scale clearance of terraced houses and industry in the 1990s. 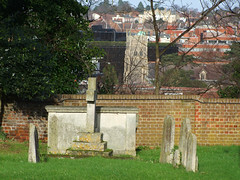 But the continued redevelopment around the docklands has begun to redress the balance, and in any case, and rather pleasingly, St Mary at Stoke still turns its back in its traditional manner on the town centre across the river, to be the flagship church of the South-West Ipswich Team Ministry, serving, along with the modern estate churches, more than thirty thousand people in the areas of Stoke Park, Thorington Hall, Chantry and Pinewood.